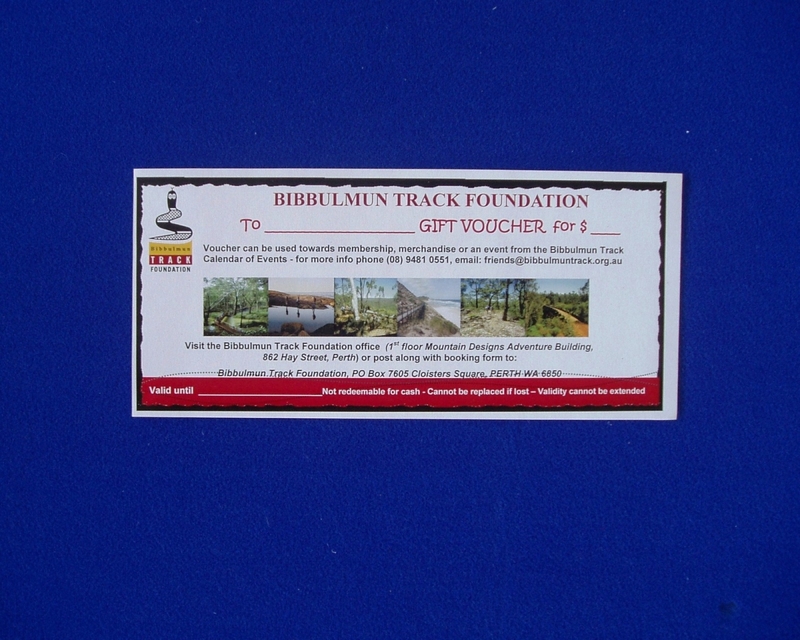 E-vouchers can be used for merchandise, membership or Calendar of Events with the Bibbulmun Track Foundation. E-vouchers are designed to be used for any online purchases. When you buy an e-voucher, we will email you, or the recipient (if you supply us with their email address), the e-voucher as a pdf with a special code which can be used immediately in our online shop. If the voucher is not for you please give the name of the recipient in the comment box when you make the purchase. E-vouchers are valid for 12 months from the date of issue and cannot be replaced if lost, extended, nor exchanged for cash. They can be used more than once until the amount on the e-voucher is exhausted or the e-voucher expires. Tours and Bibbulmun Walking Breaks cannot be purchased online.